Due to the success of the bake sale during veg week, join us for another Vegan Bake Sale to help advertise for the upcoming Vegan Thanksgiving Potluck. 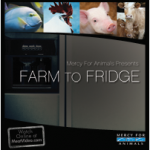 Mercy for Animals' powerful documentary, Farm to Fridge, shows the realities of modern animal agriculture. We've created a new website to help spread the word. Thanks to a generous donation, we will be running ads over the next month to get more folks to the site. You can get us free advertising by 'liking' the video and having your friends watch it as well. Please like this video to spread the word and help animals. Thanks! Formerly known as Nala Pak, Udupi and Amu's Madras Cafe, now it's Annapurna Bhavan. Same location, different all-vegetarian menu. Annapurna Bhavan serves a broad menu of South Indian vegetarian specialties. We'll be having our first dine out here on Tuesday, November 15, at 7 pm. So let's cruise on over to Columbia Heights and show our support (by eating delicious foods 🙂 to this new business! Please RSVP at our meetup page. 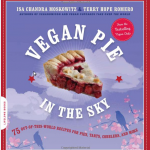 "I never realized how many vegan options were out there and the amount of people who were already vegan! It was great to participate in Veg Week – I've never met so many vegans and had such great food! Thanks for everything, CAA!" This is one of the many positive reviews we received after asking participants to tell us how the Pledge to Be Veg went for them. Veg Week 2011 was a success in raising awareness about the cruelties of factory farming and empowering people to make compassionate choices. We started Veg Week with Paul Shapiro of the Humane Society of the United States, who gave an engaging presentation on factory farming and the efforts underway to help animals. We learned about cruel practices, such as battery cages that confine egg-laying chickens to tiny cages, leaving them unable to stretch their wings. We learned about gestation crates, where sows are kept and unable to turn around. But we also learned about the efforts across the country to outlaw the most cruel practices, work with the industry to reform these practices, and encourage consumers to incorporate more plant-based foods in their diet. Several students studying agriculture asked Paul challenging questions at the end of the presentation, and Paul handled them respectfully and knowledgeably. There were seven more events and there isn't room to cover what happened at all of them! 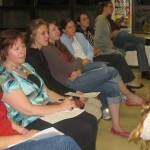 The events, including the cooking class, Shop With A Vegan, dine out, vegan bake sale, Vegan After Dark, potluck, and sanctuary tour, gave participants new opportunities to learn veg eating and cooking, meet animals, eat tasty food, and especially meet other people who care about animals. You can read more about the cooking class here. 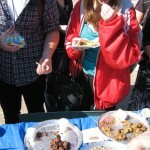 Thanks as well to all the volunteers that made Veg Week 2011 a success! On a typical Wednesday morning at the U of M, students are crossing the Washington Avenue bridge with their heads down, their eyes avoiding the sun, their headphones in their ears blocking out the noise around them. Once in awhile they look up to anticipate oncoming bicycle traffic, or greet a friend. But on Wednesday, September 28th, a strange set of tables with a tent and a grill were occupying the space that normally sits empty in the landscape. 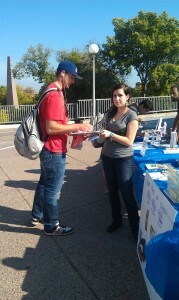 That tent was Compassionate Action for Animals' Vegan Food Showcase to advocate for animal and the upcoming Veg Week. To many students' delight, it was offering free food. The event was a smash hit. The table was constantly swamped with students trying out the food during the passing time between classes. Many students remembered Veg Week from last year and were very excited to take the Pledge to be Veg once again, promising to change their eating habits from October 1st through the 9th. 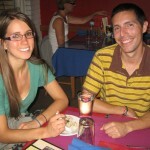 They warmly remembered their favorite foods and restaurants that they enjoyed during that time. Some of the foods that students got to try were Silk soy milk and Coconut Bliss ice cream. The Gardein 7-Grain meat, which is made with grain, mimics real meat in both its taste and texture. The mock chicken crispy tenders and "beefless tips" were a big revelation for many students that veganism isn't just about salads. A surprising number of people the volunteers talked to were already vegetarians, and after the slightest coaxing, they pledged to take the inevitable plunge to be vegetarian or vegan for just one short week. During the lower traffic moments, passers-by were excited to hold an in-depth conversation with the volunteers. Once students had a little more information and asked some questions of a practicing vegetarian or a passionate vegan, they were much more likely to sign up. The main selling point in convincing people to sign the pledge was to tell them about the support system the CAA offers for the week. The students who seemed wary about pledging initially warmed up to the idea once volunteers mentioned the available coupons, Vegetarian Starter Kit, and the supporting events held throughout Veg Week so that novices and experts alike can come together with questions and struggles. In total, 237 people pledged to join us in celebrating and participating in Veg Week! CAA is proud to host Veg Week's exciting events, including a potluck on Saturday and a chicken sanctuary tour on Sunday. See you there! Have you taken the pledge yet? Now's the time! Pledge to be vegetarian or vegan from October 1 to 9 and get restaurant discounts, a care pack, and be eligible for raffle prizes! 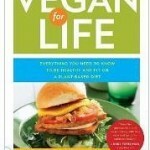 Remember the book we recommended, Vegan for Life?